WATKINS, MN (KTRK) -- Officials say there is some serious damage after two tornadoes ripped through several Minnesota counties overnight. 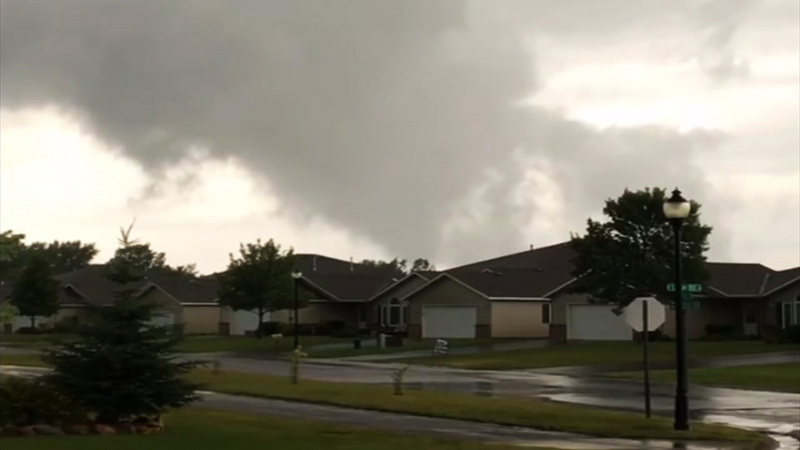 The tornadoes hit the central part of the state Monday night, uprooting trees and damaging homes in the towns of Watkins and Litchfield. Emergency officials say the tornado damage is the worst they have seen in at least a decade. Jon Jacklitch says their town was calm, and then suddenly, chaos ensued. "It was kind of calm outside and the sirens went off, and the trees started whipping all around and we went inside," Jacklitch says. "Maybe a minute later, we heard our windows shatter and we knew it was hitting right about then. Sirens kept going for quite a while, so we didn't come out for quite a while either." Officials say they had to evacuate an assisted-living facility in the area.